Beer brewing is experiencing something of a renaissance at the moment. Since 2000 the number of breweries in America has tripled, data from the Brewers Association shows. This growth in breweries is great news for beer drinkers across the country no matter where they live. But whether it comes to prices, variety or availability, some cities are better than others for quenching a beer lover’s thirst for the carbonated beverage. Below we investigate which cities every beer drinker needs to check out. In order to determine the best cities for beer drinkers, we looked at metrics like the number of microbreweries per city, the number of microbreweries per 100,000 residents, the number of bars per 100,000 residents, the average Yelp score of breweries and the average price of a pint in each city. For more on where we got our data and how we put it together, read the data and methodology section below. Beer paradises – Montana, North Carolina and Ohio are the three states that appear twice in our top 10. Considering the population size of Montana, it’s quite a feat that two of its cities made the cut. Wide range in microbreweries – There is wide variance in our top 10 for number of microbreweries. Asheville, our no. 1 city, has almost eight times as many microbreweries per resident as Pittsburgh, our third-ranked city. Asheville has knocked off Portland, Maine to take the no. 1 spot in this year’s study of best cities for beer lovers. Asheville has the most microbreweries per 100,000 residents of any city in the U.S. at 27.12 and is host to multiple annual beer festivals. Despite being a relatively small city with only 88,000 residents, beer is so loved here that the population manages to support 24 microbreweries. That’s the 12th-most in the country. Portland, Maine falls one spot to rank second in this year’s edition of the best cities for beer drinkers. Portland is a lot like Asheville. It’s a smaller city with a big appetite for beer. Portland has a population of 66,000 and 16 microbreweries, the 24th-most in the country. And you probably won’t go wrong no matter which microbrewery you try. The average Yelp rating for a microbrewery in Portland is 4.33. Pittsburgh rose six spots from last year’s study to take third place this time around. Relative to some other cities, Pittsburgh does not have a ton of microbreweries (it has 11). But it makes up for that in the bar category. 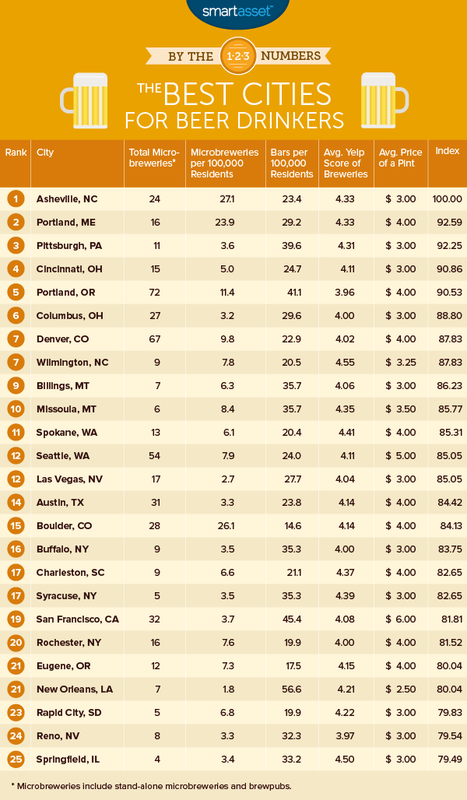 Pittsburgh has the second-highest number of bars per 100,000 residents in our top 10. This city won’t break your budget either. According to Numbeo, the average price of a pint of beer in the ‘Burgh is only $3. Find out: How much should you contribute to your 401(k)? Cincinnati is the highest-rated Ohio city in our study, sneaking ahead of Columbus which finished sixth. In the past we’ve found that Cincinnati is a great city for new college grads, who are known as beer lovers. Cincinnati has 15 microbreweries with Rhinegeist and MadTree being the most popular, according to a Cincinnati.com poll. Given that craft beers and breweries can be expensive, it’s a bonus to beer lovers in Cincinnati that there are plenty of drinking alternatives. Cincinnati has 24 bars per 100,000 residents and with the average pint costing $3, beer lovers of all types should find something suitable. The beer scene is just one reason why Portland, Oregon is a great city. Portland leads the way in terms of total microbreweries with 72. It was also an early convert to the microbrewery movement, with BridgePort Brewing and Widmer Brothers Brewing both opening in 1984. However Portland has the most expensive average pint price ($4) in the top 10, which hurt it in our rankings. Related Article: 15 Things You Need to Know Before Moving to Portland. Columbus is a newcomer to the top 10. Last year it ranked 14th. Since last year, it has added four new microbreweries bringing the total to 27. Columbus also has cheap pints and lots of places to imbibe those pints. There are 29 bars per 100,000 residents in Columbus and the average pint costs $3. The Mile High City, known for the Rocky Mountains, is also home to a whopping 67 microbreweries. That is the second highest in our study. Denver also has the fifth-highest number of microbreweries per 100,000 residents. There are almost 10 microbreweries per 100,000 residents. Beer lovers who have not visited the Wilmington area should mark down Oct. 21 – 28, 2017 as a good time to visit. That’s Wilmington Beer Week when the city gets together to celebrate the deliciousness of a craft beer. Also, make sure to have Wilmington Brewing Company on your to-do-list. It has a sterling 4.8 rating on Yelp. The Wilmington Brewing Company is one of nine total microbreweries in the city, meaning Wilmington has 7.76 microbreweries per 100,000 residents. Billings is the first of two Montana cities which round out our top 10. Beer lovers will have a wide variety of bars to choose from. Our data shows that Billings has 35 bars per 100,000 residents. That’s the second-highest rate in the top 10. Billings only has seven total microbreweries, which is the second-lowest in the top 10. But relative to population, it’s still a fairly large number. Billings has 6.35 microbreweries per 100,000 residents. 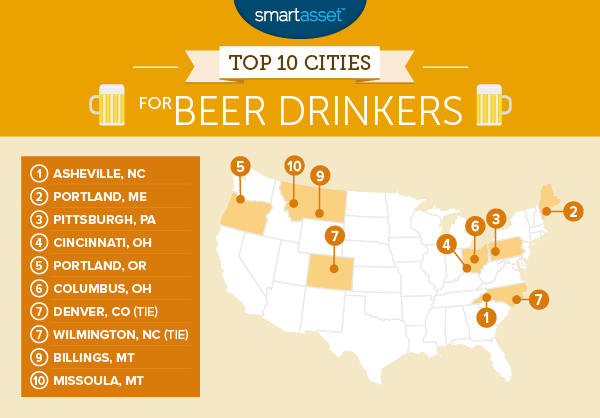 Missoula completes our top 10 best cities for beer drinkers. This city has some of the best breweries in the country, judging by Yelp data. The average Yelp rating for a Missoula brewery is 4.3. Beer lovers coming to Missoula for the first time should check out the Draught Works Brewery. It has won multiple awards in the Great American Beer Festival, including a gold medal in the American-style strong pale ale category. Total number of microbreweries and brewpubs. Data comes from brewerydb.com. Number of microbreweries and brewpubs per 100,000 residents. Data on microbreweries and brewpubs comes from brewerydb.com. Population data comes from the U.S. Census Bureau 1-Year American Community Survey. Average Yelp score of breweries. Data comes from Yelp. Number of bars per 100,000 residents. Data on bars comes from the U.S. Census Bureau’s 2014 American Business Patterns Survey. Data on population comes from the U.S. Census Bureau’s 1-Year American Community Survey. Average price for a pint of domestic draught beer. Data comes from Numbeo.com. We ranked each city across each metric, giving the total number of micobreweries and brewpubs a double weighting, the number of microbreweries and brewpubs per 100,000 residents and bars per 100,000 residents a single weighting and half weightings to the average Yelp score and average price of a pint. We then averaged those rankings. The city with the best ranking was given a score of 100. The city with the worst ranking was given a score of 0.